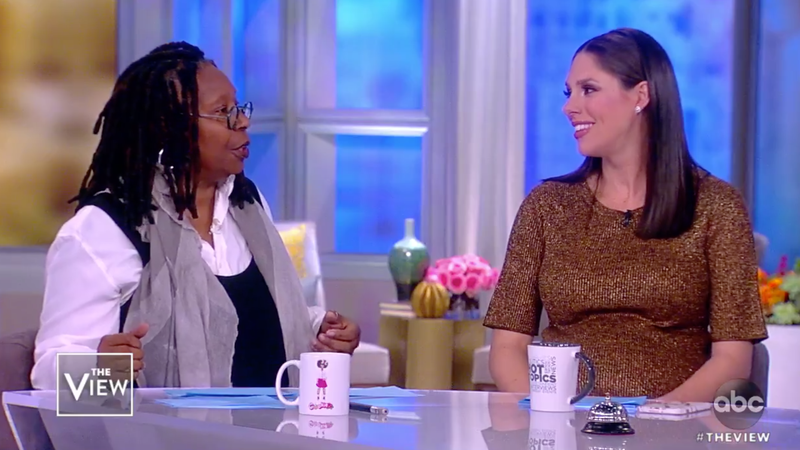 The women of The View appear to collectively agree that former Nevada Assemblywoman Lucy Flores’s decision to come forward about an experience on the campaign trail with Joe Biden, where she says he inappropriately touched her during a 2014 event, was a politically motivated hit, Me Too gone rogue, and a misunderstanding of Biden’s friendliness. Abby Huntsman wondered why Flores didn’t simply send Biden a letter about the encounter as to not make the incident public. She suspected there was a political motive behind Flores’s decision to speak out and used this opportunity to throw in some Me Too skepticism. “I’ve had concerns about the Me Too movement from the beginning, about getting to this place where you can’t have normal interactions with each other,” Huntsman said. Co-host Sunny Hostin was the only one to prioritize Flores’s discomfort over warm and fuzzy feelings about Biden. She went on to note that she appreciated Biden’s response to Flores’s accusations, in which Biden said that while he never intended to make Flores uncomfortable, he believes men—including himself—should pay more attention to women’s experiences. “I don’t know if we will see anymore smelling of hair and kisses on the forehead,” said Hostin. McCain also addressed Flores’s alleged support of Bernie Sanders and Beto O’Rourke, and how that may have affected her decision to call out Biden. It’s hard to determine which moment of this excruciating eight minute and 32 second video was the most baffling: The panel implying that their personal interactions with Biden exonerate him of any creepy behavior, or the panel agreeing that Flores’s accusations don’t rise to Harvey Weinstein “levels” of assault, which was never the point in the first place.